Retro Modern. It’s a thing now. honest! It tells me there is more then just the voice of Retro Reaction asking for what was old to be new again! We asked for one more west and we got it in Batman Return of the Caped Crusaders. 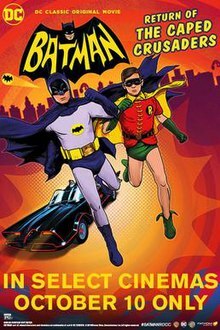 An animation that brought Adam West back as Batman and Holy Retro Return Batman.. Did it work. I was concerned that the tone would end up wrong. That they would aim at the 60s TV series and go off into complete out of the way oddness. Particularly with big action sequences. It’s something some of the early Batman 66 Comic’s seemed to do. This animated feature seems to understand that it was all about the dialog. The crazy scenes come. I mean Batman and Robin go to space! Batman turns evil. But these are all plot lines that could have happened in the TV show. What we end up with is a nice tribute that plays out much like a 3 part episode of Season 3 would have. It doesn’t reach the heights of the 1st season but more light hearted Batman and More Adam. Reviewing this all I can say is that it’s a fitting tribute to the series and if you liked the 60s Humour you won’t be disappointed. Yes it goes a little overboard on surrealism. But then there was plenty of that back in the day too. West can only be a good thing. Thankfully it seems that we are getting more than just 1 more west. We’re getting at least another!It was announced that the lost episode of the 60s TV series that would have introduced Two Face would be made into an animated feature. William Shatner will be voicing Two Face. More on the lost episode in a few times on our 3 part 60s Bat Spechail here at Reaction.